Earlier this year a trio of new attractions debuted in Orlando, FL. The Orlando Eye, Madame Tussauds, and SEA LIFE Aquarium have opened to much fanfare in Central Florida, each part of I-Drive 360, a new dining and entertainment destination on the popular International Drive. 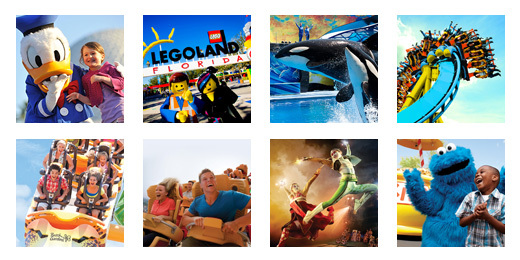 TicketsatWork.com is delighted to offer super savings on three separate ticket packages for our members to visit these new attractions one at a time, two at a time, or all three in one big day of fun in Orlando! But first, click over to TicketsatWork.com and discover admission ticket savings of over 45%. The Orlando Eye – Standing at 400-feet high, nearly 100-feet taller than the Statue of Liberty, The Orlando Eye is the tallest observation wheel on the U.S. East Coast. Similar to London’s world-famous landmark, the Orlando Eye provides guests with the opportunity to escape the hustle and bustle of Central Florida within fully enclosed, air-conditioned glass capsules. The tranquil journey allows visitors to take in a unique perspective of the area including nearby theme parks and attractions, the downtown Orlando skyline, as well as lakes and lush landscape. On a clear day you can see Cape Canaveral on Florida’s East Coast. The attraction also offers a 4D cinematic experience showcasing a 3D aerial journey of Central Florida with added effects including fireworks, wind, scents and lighting. Madame Tussauds Orlando – There is lots of excitement surrounding the opening of the world’s most famous celebrity wax attraction in Orlando. Madame Tussauds showcases incredibly detailed and lifelike wax figures that pay tribute to the most influential celebrity and historical figures of our time. SEA LIFE Orlando – Get ready to experience a new wave of underwater adventures with beautiful displays of colorful fish, sharks, jellies, sea horses, rays, sea turtles and more. Winding tunnels, floor-to-ceiling and bubble aquariums and cold water rock pools provide a unique experience for all guests as they are introduced to more than 5,000 sea animals in habitats representing the Atlantic, Indian and Pacific Oceans.